I haven’t done much painting for a long time but, with a week of art due at the end of July (this ‘Out of India‘ week), I’ve decided to try and get my hand back in so that I don’t waste the time when I should be responding to the subject by being too weak on my fundamental skills. Last year I did a week on Japanese woodblock printing which I haven’t carried on with as much as I though I might but I did get a set of watercolour pigment in tubes so I’m having a go at learning to paint with those. On Sunday afternoon I sat in the garden and messed around with some painting based on the plants I saw. It was a worthwhile exercise but probably the most important result was realising that I need to go right back to basics. Indeed, I’m not sure I ever really applied myself to learning the underlying techniques. I painted more with enamels and acrylics, with some forays into gouache and oils, but watercolours have their own beauty – and challenges. I’ve recently had a couple of books out of the library on the subject but these weren’t at a basic enough level so, this week, I picked up Basic Watercolour: how to paint what you see by Charles Williams. Above you can see yesterday evening’s work, the absolutely elementary exercise of creating a simple wash. Simple? It takes a bit of work, as you can see. 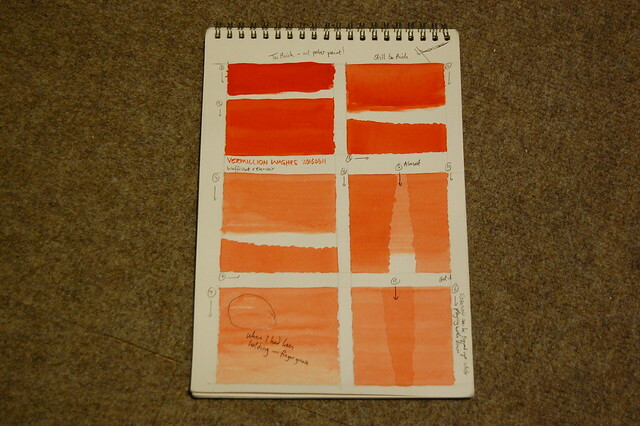 I picked a single colour, vermillion red, and, if you click on the image to view on Flickr, you can see the numbers which show the sequence of attempts and the arrows which show the direction of each one. The theory is that you create a bead of paint along the top of the shape and, holding the paper at an angle, break the tension on the lower edge, allowing it to spread down the page in a controlled fashion. Most of the time time the brush is controlling the paint rather than applying the paint, if you can see the distinction. The very vivid colour at the top left is where I hadn’t added nearly enough water. Tubed watercolour does allow this kind of application but I think it is missing the point of choosing watercolour instead of more opaque types of pigment. I watered it down through several more steps but had a number of attempts where I didn’t have enough pigment in my ‘reservoir’ (as Williams describes it). I persisted though and gradually began to get a better flow. I’ll have another go tonight; probably a different colour but essentially the same exercise to revise and reinforce my developing skills.